December 27, 2004 – Stampede: Harry Smith and TJ Wilson defeated Gama Singh Jr. and Tiger Raj Singh by disqualification. January 7, 2005 – Stampede: Gama Singh Jr. and Tiger Raj Singh vs. Harry Smith and TJ Wilson ended in a no contest. January 14, 2005 – Stampede: Gama Singh Jr. and Tiger Raj Singh defeated Teddy Hart and TJ Wilson. January 21, 2005 – Stampede: Gama Singh Jr. defeated Dusty Adonis. January 28, 2005 – Stampede: Gama Singh Jr. defeated D. Dwight Davis. February 4, 2005 – Stampede: Gama Singh Jr. defeated Morris Kayfabian. February 11, 2005 – Stampede: Duke Durrango defeated Gama Singh Jr. by disqualification. February 18, 2005 – Stampede: Gama Singh Jr. and Tiger Raj Singh defeated Duke Durrango and Karnage. February 25, 2005 – Stampede: Duke Durrango and Karnage defeated Gama Singh Jr. and Tiger Raj Singh in a best 2 out of 3 falls match. February 26, 2005 – Stampede: Gama Singh Jr. and Tiger Raj Singh defeated Dusty Adonis and Phoenix Taylor. March 4, 2005 – Stampede: Gama Singh Jr. and Tiger Raj Singh defeated Duke Durrango and Karnage in a best 2 out of 3 falls match to win the International tag team titles. March 5, 2005 – PWA: The Funky Bunch (Marky Mark and Phoenix Taylor) defeated The New Karachi Vice (Gama Singh Jr. and Raj Singh). March 11, 2005 – Stampede: Gama Singh Jr. and Tiger Raj Singh defeated Duke Durrango and Karnage. March 18, 2005 – Stampede: Duke Durrango and Karnage defeated Gama Singh Jr. and Tiger Raj Singh by disqualification. March 19, 2005 – Stampede: Gama Singh Jr. and Tiger Raj Singh defeated Danny Myers and Randy Myers. March 25, 2005 – Stampede: Gama Singh Jr. and Tiger Raj Singh defeated Apocalypse and Karnage by disqualification. April 1, 2005 – Stampede: Gama Singh Jr. and Tiger Raj Singh defeated Apocalypse and Karnage. April 8, 2005 – Stampede: Gama Singh Jr. defeated Morris Kayfabian. April 15, 2005 – Stampede: Gama Singh Jr. defeated Matt Richards and Scott Savage in a 3-way match. April 23, 2005 – Stampede: Gama Singh Jr. and Tiger Raj Singh defeated Dusty Adonis and Phoenix Taylor. May 6, 2005 – Stampede: Pete Wilson defeated Gama Singh Jr..
May 13, 2005 – Stampede: Gama Singh Jr. defeated D. Dwight Davis. June 18, 2005 – PWA: The Funky Bunch (Marky Mark and Phoenix Taylor) defeated The New Karachi Vice (Gama Singh Jr. and Raj Singh). August 27, 2005 – PWA: The Funky Bunch (Marky Mark and Phoenix Taylor) defeated Gama Singh Jr. and Raj Singh & Harry Smith and TJ Wilson in a 3-way tag team match to retain the Canadian tag team titles. September 30, 2005 – Stampede: Dan Myers defeated Gama Singh Jr..
October 8, 2005 – PWA: The Funky Bunch (Marky Mark and Phoenix Taylor) defeated New Karachi Vice (Gama Singh Jr. and Raj Singh) to retain the Canadian tag team titles. October 13, 2005 – Stampede: Gama Singh Jr. defeated Mikey Grizzwald and Pete Wilson in a 3-way match. October 14, 2005 – Stampede: Pete Wilson defeated Gama Singh Jr..
October 28, 2005 – PWA: Pete Wilson and Randy Myers defeated Gama Singh Jr. and Tiger Raj Singh win the International tag team titles. November 4, 2005 – Stampede: Pete Wilson and Randy Myers edfeated Gama Singh Jr. and Tiger Raj Singh to retain the International tag team titles. December 16, 2005 – Stampede: Gama Singh Jr. and Tiger Raj Singh defeated Pete Wilson and Ravenous Randy to win the International tag team titles. January 13, 2006 – Stampede: Pete Wilson defeated Gama Singh Jr..
January 22, 2006 – PWA: Gama Singh Jr. and Randy Myers defeated Marky Mark and Phoenix Taylor. February 10, 2006 – Stampede: Harry Smith defeated Gama Singh Jr. by disqualification. March 10, 2006 – Stampede: Gama Singh Jr. and Tiger Raj Singh defeated Dan Myers and Mikey Grizzwald. March 18, 2006 – WWC: Brent Dail and Gama Singh Jr. defeated Alex Montalvo and Chris Joel by disqualification. Montalvo & Joel retains the tag team titles. March 24, 2006 – WWC: The Anti-Puertorrican Threat (Brent Dail and Gama Singh Jr.) defeated D’Jour (Dave D’Jour and David D’Jour). March 25, 2006 – WWC: Ash and Joe Bravo defeated Brent Dail and Gama Singh Jr..
April 16, 2006 – WWC: The Anti-Puertorrican Threat (Brent Dail and Gama Singh Jr.) defeated D’Jour (Dave D’Jour and David D’Jour). April 22, 2006 – WWC: Stefano defeated Gama Singh Jr. to retain the junior heavyweight title. April 23, 2006 – WWC: Gama Singh Jr. defeated Stefano. 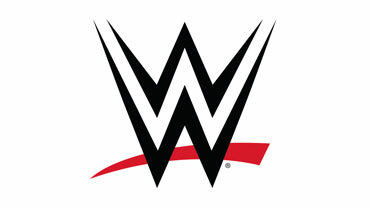 April 29, 2006 – WWC: SWAT Team (SWAT #1 and SWAT #2) defeated Gama Singh Jr. and The Hunter. May 6, 2006 – WWC: Brent Dail defeated Stefano and Gama Singh Jr. in a 3-way match to win the junior heavyweight title. May 12, 2006 – WWC: Gama Singh Jr. defeated El Puma Jr..
May 19, 2006 – WWC: D’Jour (Dave D’Jour and David D’Jour) defeated Gama Singh Jr. and Super Star Romeo. May 20, 2006 – WWC: Brent Dail defeated Gama Singh Jr. to retain the junior heavyweight title. May 26, 2006 – Stampede: Gama Singh Jr. and Tiger Raj Singh vs. Dusty Adonis ad Michael Avery ended in a no contest. July 8, 2006 – PWA: Gama Singh Jr. and Raj Singh defeated Michael Avery and Randy Myers. July 28, 2006 – Stampede: Gama Singh Jr. and Tiger Raj Singh defeated Chucky The BoyWonder and Michael Avery. August 11, 2006 – Stampede: Apocalypse defeated Gama Singh Jr..
August 25, 2006 – Stampede: Ravenous Randy defeated Gama Singh Jr..
October 20, 2006 – Stampede: Juggernaut, Teddy Hart and TJ Wilson defeated Gama Singh Jr. and Tiger Raj Singh in a handicap match. November 3, 2006 – Stampede: Juggernaut, Nattie Neidhart and TJ Wilson defeated Dusty Adonis, Gama Singh Jr. and Tiger Raj Singh. January 12, 2007 – Stampede: Evan Adams defeated Gama Singh Jr..
January 26, 2007 – Stampede: The A-Team (Dusty Adonis and Michael Avery) defeated The New Karachi Vice (Gama Singh Jr. and Raj Singh). February 9, 2007 – Stampede: Gama Singh Jr. defeated Evan Adams. February 23, 2007 – Stampede: Evan Adams defeated Gama Singh Jr.. Ja Jacobe and Scotty Mac defeated Gama Singh Jr. and Tiger Raj Singh. March 23, 2007 – Stampede: Juggernaut and Matt Vaughn defeated Gama Singh Jr. and Tiger Raj Singh. April 20, 2007 – Stampede: Ja Jacobe and Scotty Mac defeated Gama Singh Jr. and Tiger Raj Singh. May 20, 2007 – Wrestling Supershow: The Funky Bunch (Marky Mark and Phoenix Taylor) defeated The New Karachi Vice (Gama Singh Jr. and Raj Singh) & The A-Team (Dusty Adonis and Michael Avery) in a 3-way tag team elimination match. June 23, 2007 – PWA: Chucky The BoyWonder, El Reverso, Gama Singh Jr., Lucas Drago and Slammer defeated Brandon VanDanielson, Corporal Punishment, Dan Myers, Jack Sloan and Raj Singh. August 23, 2007 – Wrestling Supershow: The New Karachi Vice (Gama Singh Jr. and Raj Singh) defeated Dave Titan and Randy Myers. August 25, 2007 – PWA: Johnny Handsome, Red Thunder and White Lightning defeated Gama Singh Jr., Raj Singh and The Highlander. September 7, 2007 – Stampede: The A-Team (Dusty Adonis and Michael Avery) defeated The New Karachi Vice (Gama Singh Jr. and Raj Singh) to retain the International tag team titles. September 21, 2007 – Stampede: Chris Steele defeated Gama Singh Jr. and Raj Singh and Ravenous Randy in a 4-way elimination, three stages of hell match to win the vacant Stampede North American Heavyweight title. October 12, 2007 – Stampede: Chris Steele defeated Gama Singh Jr. and Raj Singh in a 3-way match to retain the Stampede North American Heavyweight title. October 19, 2007 – PWA: Red Thunder and White Lightning defeated Gama Singh Jr. and Raj Singh to retain the tag team titles. October 20, 2007 – PWA: Gama Singh Jr. and Raj Singh defeated Red Thunder and White Lightning to win the tag team titles. October 26, 2007 – PWA: The New Karachi Vice (Gama Singh Jr. and Raj Singh) defeated Evan Adams and Scotty Putty. November 16, 2007 – Stampede: Chucky Blaze defeated Gama Singh Jr..
November 30, 2007 – Stampede: The New Karachi Vice (Gama Singh Jr. and Raj Singh) defeated Beauty And The Beast (Deryck Crosse and Rocky Merrick). December 14, 2007 – Stampede: Gama Singh Jr. defeated Chucky Blaze to win the Stampede British Commonwealth Mid-Heavyweight title. December 21, 2007 – PZW: Superfly Dan defeated Gama Singh Jr..
January 4, 2008 – Stampede: The New Karachi Vice (Gama Singh Jr. and Raj Singh) defeated RAGE (Brandon VanDanielson and Chucky Blaze). January 9, 2008 – PZW: Gama Singh Jr. vs. Travis Copeland ended in a double count-out. January 18, 2008 – Stampede: Gama Singh Jr. defeated Chucky Blaze to retain the Stampede British Commonwealth Mid-Heavyweight title. February 15, 2008 – Stampede: Gama Singh Jr. defeated T-Bone. June 20, 2008 – PWA: Chris Steele and The Highlander defeated Gama Singh Jr. and Raj Singh to win the Canadian tag team titles. Gama Singh Jr. defeated Michael Avery and Scotty Mac in a 3-way match to win the PWA title. July 4, 2008 – Wrestling Supershow: Samoa Joe defeated Gama Singh Jr. by disqualification to retain the TNA World heavyweight title. July 5, 2008 – Wrestling Supershow: Hannibal and Samoa Joe defeated The New Karachi Vice (Gama Singh Jr. and Raj Singh). November 14, 2008 – Wrestling Supershow: The New Karachi Vice (Gama Singh Jr. and Raj Singh) defeated Bobby Fletcher and Scott Lee Crue. March 27, 2009 – PWA: Raj Singh and Randy Myers defeated Chris Steele and Gama Singh Jr..
April 24, 2009 – PWA: Gama Singh Jr. defeated M.
April 25, 2009 – PWA: Gama Singh Jr. defeated Chris Steele. November 27, 2010 – PWA: Gama Singh Jr. defeated Strife. March 19, 2011 – PWA: Chucky Blaze, Gama Singh Jr., Jason Anderson, M and Tex Gaines defeated Alex Plexis, Brady Roberts, Brandon VanDanielson, Dean Durrango and Duke Durrango. October 22, 2011 – PWA: Gama Singh Jr. defeated Bobby Sharp. April 20, 2012 – PWA: Brady Malibu defeated Gama Singh Jr..
October 13, 2012 – PWA: Gama Singh Jr. defeated Sheik Akbar Shabaz. January 26, 2013 – PWA: Brandon VanDanielson defeated Gama Singh Jr..
February 2, 2013 – PWA: Travis Cole defeated Gama Singh Jr..
March 2, 2013 – PWA: M defeated Gama Singh Jr..
March 30, 2013 – PWA: Deryck Crosse defeated Brody Malibu, Gama Singh Jr. and Travis Cole in a 4-way match. February 28, 2014 – ASW: Gama Singh Jr. defeated Christopher Ryseck. March 1, 2014 – ASW: Gama Singh Jr. defeated Kyle Sebastian by disqualification. Sebastian retains the ASW Trans Canada Heavyweight title. October 24, 2014 – ASW: Gama Singh Jr. and Jinder Mahal defeated Cougar Meat (Collin Cutler and Kyle Sebastian) to win the tag team titles. November 29, 2014 – ASW: Travis Sionys defeated Gama Singh Jr..
January 31, 2015 – ASW: Gama Singh Jr. and Jinder Mahal defeated Nick Price and Travis Sionys to retain the tag team titles. March 28, 2015 – ASW: Cody Smith and Travis Sionys defeated Gama Singh Jr. and Jinder Mahal & Christopher Ryseck and Johnny Obsession in a 3-way tag team match to win the tag team titles. 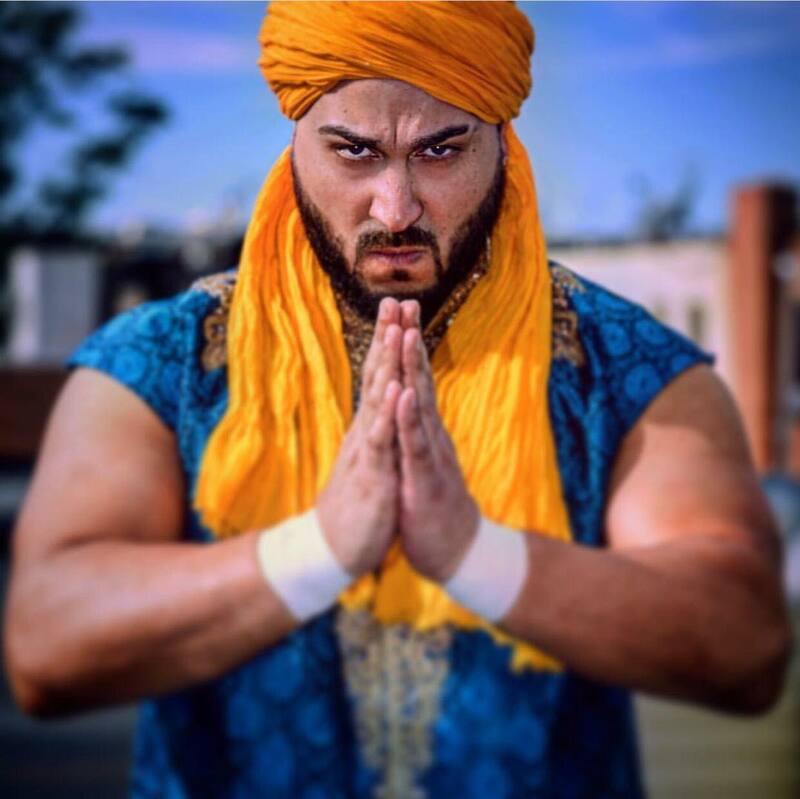 January 29, 2016 – ASW: Azeem The Dream and Christopher Ryseck defeated Gama Singh Jr. and Jinder Mahal. February 26, 2016 – ASW: Gama Singh Jr. defeated Damon The Bod. August 16, 2018 – RCW: Gama Singh Jr. defeated Dylon Knight in the 1st round. August 17, 2018 – RCW: Matt Hart defeated Gama Singh Jr. in the semi-finals. November 1, 2018 – IMPACT Wrestling: The Desi Hit Squad (Raj Singh and Rohit Raju) w Gama Singh defeated The Beach Bums (Freddie IV and TJ Crawford). November 23, 2018 – RCW: Raj Singh defeated Matt Hart. 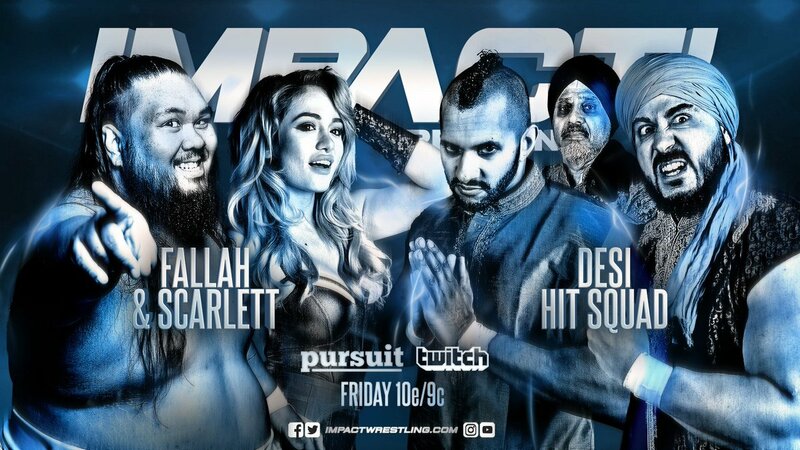 December 6, 2018 – IMPACT Wrestling: The Desi Hit Squad (Raj Singh and Rohit Raju) defeated Damian Drake and Manny Lemons. December 14, 2018 – HIW: Davey O’Doyle and Raj Singh defeated Bobby Sharp and VIP in the 1st round. Davey O’Doyle and Raj Singh defeated Jude Dawkins and Sheik Shabaz in the semi-finals. Michael Richard Blais defeated Davey O’Doyle, El Asesino and Raj Singh in a 4-way match to win the King’s Challenge IX. January 4, 2019 – RCW: Raj Singh defeated Matt Hart by disqualification. January 18, 2019 – HIW: Raj Singh defeated Shaun Martens. January 25, 2019 – IMPACT Wrestling: The Rascalz (Dezmond Xavier and Zachary Wentz) defeated The Desi Hit Squad (Raj Singh and Rohit Raju) w Gama Singh. February 8, 2019 – IMPACT Wrestling: Trey Miguel w Dezmond Xavier and Zachary Wentz defeated Raj Singh w Gama Singh & Rohit Raju. February 9, 2019 – IMPACT Wrestling Xplosion: Trey Miguel defeated Raj Singh w Gama Singh. @TrueRajSingh @ChampionMyzter @IMPACTWRESTLING @HakimZane @Lady_Scarlett13 @FALLAH1 Hakim Zane and Raj singh are best wrestlers of India.